CALGARY, AB – In the latest example of a brewery trying to bring a feminine touch to their product, Minhas Brewery has launched Uptown Girl, a new trio of brands aimed squarely at the young female market. 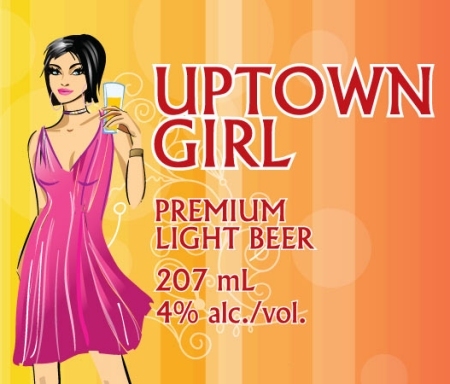 The Uptown Girl brands are available now at liquor stores throughout Alberta. They are currently being brewed at the Minhas facility in Monroe, Wisconsin, but some of the production is expected to move to the new Minhas Micro Brewery in Calgary when it opens later this spring. Shame on you Minhas. Shame on you for so, so many things. A feminie touch to beer? As a woman who enjoys beer, I find this insulting. Smaller bottles, adding fruit juice and assuming that we want a light beer. They need to hire a new marketing company if this is their idea of marketing to women.